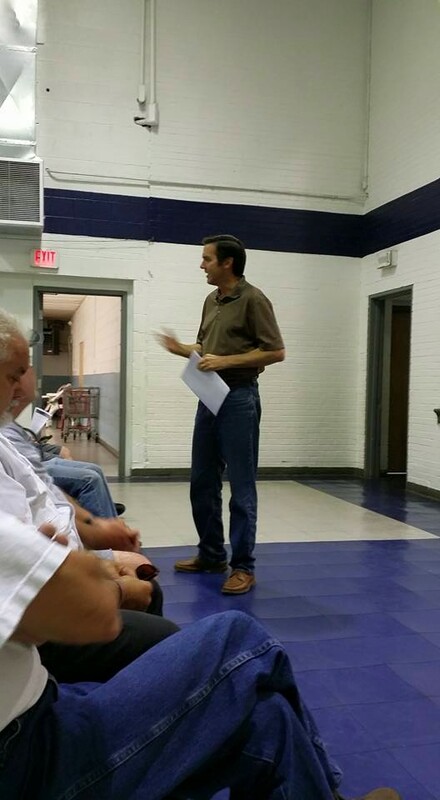 DANVILLE, WV – Approximately 50 people attended United Citizens for Coal’s (UCC) meeting held Sunday at the Danville Community Center in Danville, West Virginia. During the meeting UCC President Roger Horton officially announced the launch of the Coalfields 2030 Project – a new organization focused on protecting and preserving the region’s coal mining jobs, expanding economic opportunity, combating the area’s drug problem and improving education. On hand for the meeting were many local political leaders including Rep. Evan Jenkins (R-3rd District), State Senators Art Kirkendoll (D-Logan) and Ron Stollings (D-Boone) and Delegates Rupie Phillips (D-Logan) and Michael Moffatt (R- Lincoln, Putnam and Boone). Also on hand was Michael Browning, representing Senator Joe Manchin (D-WV). Jenkins spoke of the ongoing work in Congress to reverse the Obama war on coal. Senators Kirkendoll and Stollings spoke of the need to build support among the people of the region. Stollings compared the effort to the evangelical work of the Apostle Paul. Kirkendoll said there needs to be thousands of people attending meetings to send the message loud and clear in order to attract the attention of the media. Moffatt and Phillips talked about the things the legislature can do to help. All stressed the importance of getting more people involved in the fight. In announcing the creation of the Coalfields 2030 Project, Horton said nominations for the new organization’s board of directors and executive staff will be taken online, via email atonearmrider@yahoo.com or at the new Coalfields 2030 website athttps://coalfields2030.wordpress.com/. “Please take some time to go online and make your nominations,” Horton said. “Ideally we want a nine-person board of directors, a president, vice president and secretary. We want to move quickly to create a set of by-laws, a charter and register the organization as a 501C3 non-profit. We are also asking our local elected officials to serve as ex-officio, non-voting board members for their counsel and their expertise. This effort is too important and the need too great to do anything less. « Trumka, Roberts, It’s Time to Get Out of Your Offices and Fight!